It makes me want to strangle a puppy. And then it makes me want diamonds for my anniversary. Which is today. Twenty years, baby. Or as Rent would say, ten million five-hundred twelve thousand minutes. It’s been two whole decades since my sister did my hair, I gave myself a manicure with a polish I think they now label, “Grandma’s Powder Room”, and San Diego ordered a downpour that forced our garden reception indoors. Twenty years is kind of a long time and I dare say I have learned a lot. I learned that I share an anniversary with Mariah Carey and her ex-husband, Tommy Mottola. I learned that getting married to further your career is a recipe for a divorce. I learned that I am better at marriage than Mariah Carey. I have learned that New Year’s Eve will always be overrated, and that kissing under bright lights and mayhem at midnight is just as good as kissing under a fluorescent light in the kitchen at 9pm when you’re kissing the right person. I have learned that not all husbands cry like babies when they see their babies being born. Sometimes they hold your hand while watching the Masters and rooting for Phil Mickelson, but it’s ok. Because 16 years later he’s going to take that baby out on a daddy/daughter date and make her feel like a million bucks and she won’t remember that he didn’t cry when she was born. I’ve learned that jumping off waterfalls, exploring Israel, zip-lining through a grove of aspens and swimming with dolphins can be a lot of fun with your eternal partner. And I’ve also learned that even though it’s fun it has nothing to do with love. No, love is when I was overweight for 10 years and he never EVER mentioned it. Love is when I broke down crying in the bathroom, overwhelmed at the thought of being a first time parent and he held me and promised me we would figure it out together. Love is getting in the bed first to warm up my side while I’m taking off my makeup. Trumping all, I would say that Cory’s greatest gift to me in twenty years of marriage has been loving me when I’m not being lovable. He’s really brave. The truth about life, and in this case the truth about married life, is that the perfect moments are usually messy. For me, they haven’t been born in bistros over wine and diamonds. He’s not wearing a tux, I’m not wearing a satin gown, and we’re not standing on top of the Eiffel Tower renewing our vows. We’re usually at home. He’s trying to figure out what’s wrong with the sprinklers, I’m trying to figure out how many chocolate chips I can fit in my mouth. We’re often dealing with homework – he sits patiently aside a child and helps with math. I make cookies while they study for Finals and teach them about the dangers of emotional eating. We’re a team! The truth is, not all kisses begin with Kay. And even if they did, I’m confident that it wouldn’t be as satisfying as the commercial makes it seem. Someday they will make a commercial where the wife is sitting on the couch and her husband comes downstairs wearing a fedora and a skull shirt and asks, “What do you think?” Their 17-year-old daughter scoffs and says, “Wow. I can’t un-see that.” We’ll laugh as the husband retorts, “I kinda like it. I’m wearing it anyway.” His wife then takes him to a graduation party and jokes about her new boyfriend, Bruno Mars. I’m not sure what the commercial would be for exactly, but my family would be the stars. In the meantime, forget the diamonds. Just give me 20 more years. Beautiful! And I was thinking it couldn't be POSSIBLE that you've been married 20 years, but then I saw the picture, and it all became clear. You guys were clearly twelve on that happy day. So sweet you make my teeth hurt! Congratulations to you both, and I hope your day is lovely. Incredible written, so happy for you both! Much congrats, and know the next 20 will be even more amazing! Yes!! Congratulations on twenty years, that's an amazing accomplishment. There couldn't be anyone more perfect for you. He will probably still give you diamonds or something equally fabulous. Stupid smart phone. Sorry it published my comment three times. Happy Anniversary! This post is almost good enough to make me jump back into blogging. Yours is always a fun read. First-time commenter, but I just had to compliment you on your amazing writing skills. Thanks for sharing and happy anniversary! Love love love this...and YOU!! Happy 20th! Definitely something worthy of a celebration...even a quiet one spent at home with a handful of chocolate chips in your hand and the remote in his!! Awesome and true and SO great. Happy Anniversary! Ya sappy commercials are so untrue. I really wish there were a picture of a guy in a fedora. Congrats on the first 20! Well said. 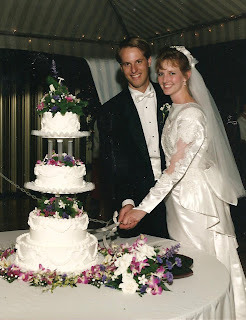 We are coming up on 23 years. We were just commenting yesterday how it has taken us so long to realize how to get it right. And you're right, it doesn't have anything to do with diamonds (although in 2015 I'm asking for some, that's not wrong is is?). Congrats to you - and here's to 20+ more years. Best anniversary post I've ever read! Love it. Wow...I really miss you. Everyone is commenting on your writing skills, which are amazing but folks....Kristy is truly like this in PERSON. I so miss your sense of humor. the stuffing choc. chip cookies in your mouth made me laugh out loud. PS. I almost forgot about that Kay commercial!!! That was fun to think about. I love the line: "I’m trying to figure out how many chocolate chips I can fit in my mouth." I would have added, "...without getting fat."